Today I decided to stay local and detect on the hayfield across from my house. It's a 50+ acre field that they just finished haying. I worked the area where the farmers stage their equipment which is directly across from my house. It's a spectator sport for the neighborhood to watch them cutting an baling the hay in August and September. They use both big round bales and small square ones and use a lot of tractors and equipment. 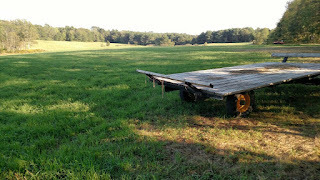 My first find was a broken horse shoe, so that gives you an idea how long they have been haying this field. The family that owned it until a few years ago had been farming it for 4 generations. That's a long time by US standards. 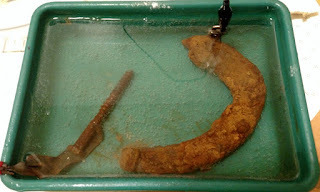 I cleaned off the loose rust and have started the electrolysis process to clean the horseshoe. I'll update this post when it is cleaned up a bit. 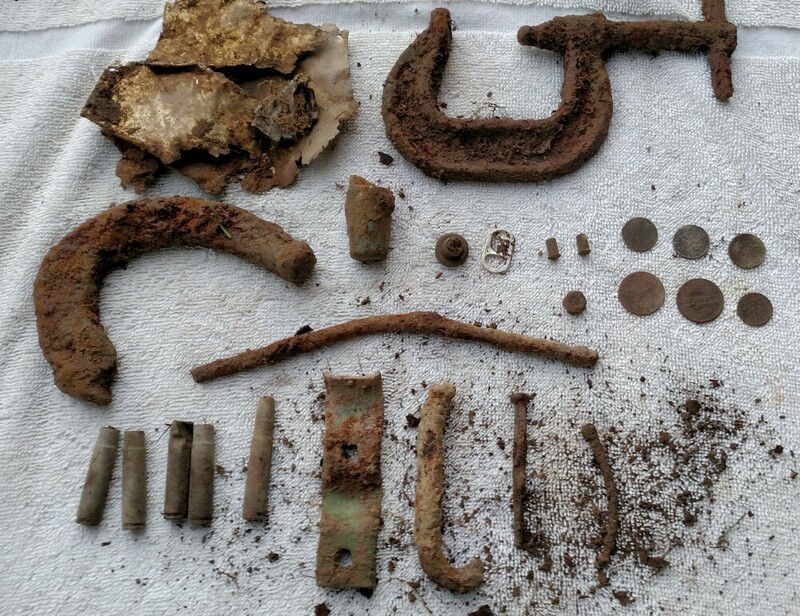 Here's the total finds for the afternoon - representing about 1.5 hours. Lance: "Piece Of Tractor mate." Andy: "Aww, now you're just making stuff up!" Well it looks like I got a few P.O.T.s in there! The farmers are often repairing their equipment and their joke is which will die first, their ancient tractors or the farmer himself who is in his 70's. I also found a number of rifle shells. I remember having to call the sheriff many years ago because a bunch of teenagers were shooting into the field right near my house. In Maine it's illegal to discharge a firearm within 300 feet of a residence, so the sheriff politely advised them of this fact. (I was not going to confront armed teenagers - I'm a Quaker and dislike weapons of any kind). So the shells clearly date from about 15 years back. I have no idea what "35 REM" means. Thanks to Brad on Facebook who explained to me that: "35 Rem designates a once popular caliber (.358 inch diameter bullet) of hunting rifle that Remington introduced in 1906 and is still in production but has fallen out of favor because of modern higher velocity. cartridges." I'll be turning the live round in to the sherrif's office soon - I tend to find a lot and take them in in batches as I accumulate them. The coins were dug up in the area where the farmer parks his tractors and obviously were pocket spills as he climbed up onto them. They are all recent - dated since 1990. 63 cents for today.